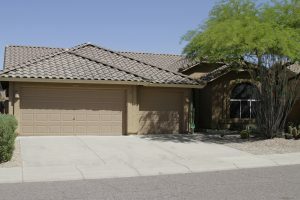 Address: 853 W Nolan Way Chandler AZ 85248 in the community of Oakwood Lakes. 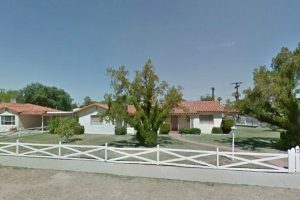 Directions: Major cross street are Chandler Heights and Alma School. From the North take Alma School Road just South of Chandler Heights then turn left onto E. Oakwood Ave, then turn left onto S. Felix Way. Turn right onto W. Nolan Way and continue about thirteen houses up on the right. Expect to find a lot of beautiful Asian pottery and artwork, including original oil paintings and a whole lot more. You will find a gorgeous Asian embroidered eight panel screen with a poem on six panels on the back side-this is an old panel passed down. 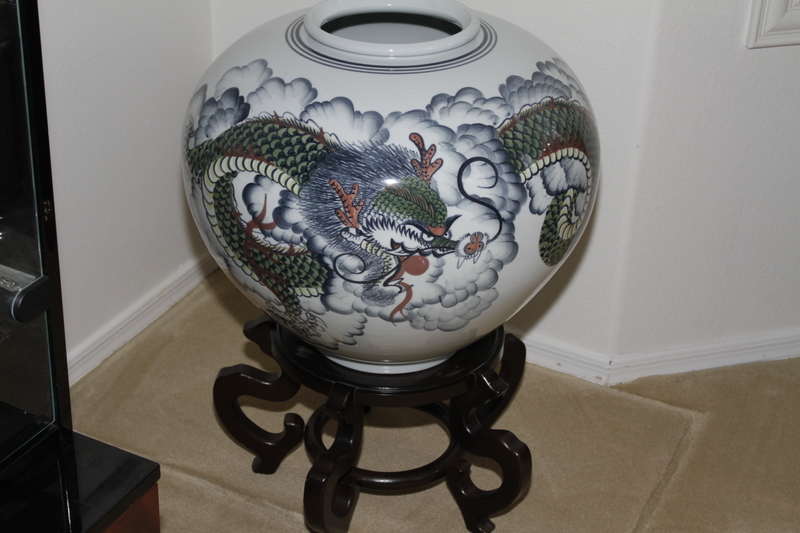 There is an incredible large Asian pot with a dragon, numerous original oil paintings and many watercolors throughout. There is a five-piece Royal Holland Pewter Coffee Pot, Creamer, Sugar and Plates, a whole lot of Rosenthal Thomas (Germany) bowls, liquor glasses, drink glasses, bowls and platters. You will find 26 Floral Thomas Rosenthal Plates, Bowls, a Tea set and Serving Dishes. There are many vintage pieces, including Vintage Syracuse China Ivory with Diamonds Plates, Vintage Syracuse China, Vintage Syracuse Casserole Dishes. There is a Noritake Stoneware set, including plates, bowls, cups and other pieces. There is a 99% Silver Korean Silver Creamer and Sugar with Tray, a Circular Mahogany Wood Table and Chairs, Gray Cloth Armchairs, and an Oak Side Table. There is a Beautiful National Geographic Wool Rug, an Oil Painting attributed to Carlo Mancini, Blue Bunny Celadon Bowl, framed watercolors of Birds. 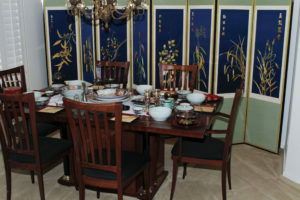 There is also a nice Carved Coconut Shell Wall Hanging, and a nice Mahogany Lacquered Table w/ eight Chairs. You will also find a large amount of Imari plates and bowls throughout, numerous Cobalt Blue Vases and other pieces, and some beautiful other pieces. There is a gorgeous Gold Gilted Bronzed Maitreya Goddess, and a vintage Bronze Buddha. There are many beautiful carved wood elephant benches. There are also many Buddha Sculptures. There is a whole lot of crystal and glassware from Rosenthal to other pieces. We have cases of brand-new vintage barware including Hennessey and Johnnie Walker. You will also find several Johnnie Walker mirrors and clocks. There are many, many furniture pieces from a Sterns and Foster Estate Lux King Mattress (like-new- retails for $2400) to vintage bedrooms suites and much more. You will find some nice stereo components from Pioneer, Yamaha, Acoustic Research, and an office full of older books. You will also find a good number of Buddha’s. There are many, many more items, including Cashmere Sweaters, a Brown Barney selection of Sweaters, vintage Diagnostic equipment, including a vintage Otoscope, an old Magnifying Glass. 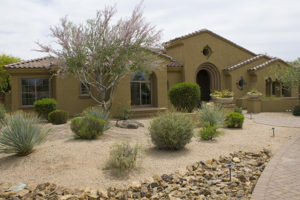 There are nice pots on the patio and a lot of unused kitchen appliances and in the garage, there are sporting goods, such as Callaway drivers and a nice King Cobra ladies set. There is also a vintage M68 wood ammo box and a whole lot of more unique items. This house is packed, and everything must go.